Greg Lawrence’s practice is focused on injury, insurance and nursing home cases. He has handled trials in the state, federal and bankruptcy courts, including cases arising from automobile accidents, civil rights violations, real estate disputes, bankruptcy disputes and insurance disputes. Greg graduated with honors from the University of Florida in 1993. During law school he volunteered as a “Council of Ten” tutor in the subject of tort law, which focuses on the rights and defenses associated with personal injury claims. For the first four years of his practice, Greg represented mostly insurance companies defending personal injury claims. Back then, his major clients included all of the “Hardee’s,” “Denny’s,” and “Quincy’s” restaurants in Jacksonville, St. Augustine, and Lake City, Florida, handling the defense of injury cases. This gave Greg unique insight into the strategies and perspectives of insurers, information which is now extremely helpful in representing injured people. Greg left the defense practice in 1998 to start his own firm focusing on plaintiff’s rights. The Lawrence Law Group’s main office is conveniently located in downtown Jacksonville on the south bank in the Riverplace Tower. Today, Greg handles personal injury cases resulting from all types of accidents including car wrecks, truck accidents, boating accidents, motorcycle accidents, nursing home neglect or abuse, assisted living facility neglect, dog bites and attacks, slip and falls, medical malpractice, defective products, workplace injuries, and wrongful death. Greg handles insurance claims including claims on the following types of policies: homeowners; auto; life; disability; health; and uninsured motorist. 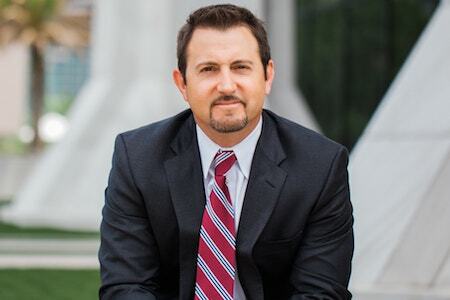 Greg also handles business litigation involving non-compete agreements, claims for unpaid wages, commissions or overtime, collections, and bankruptcy matters. Greg is "AV" rated, which the highest rating an attorney can receive from the Martindale-Hubbell peer review rating system. Greg has volunteered as a Guardian Ad Litem, through which he has been appointed to speak on behalf of children in difficult family situations. Greg has provided pro bono legal work for local and statewide environmental organizations. For example, he handled litigation and lobbying on a pro bono basis for Guana Area Intracoastal Network, Inc., a local environmental organization. He also served on the board of the Florida Wildlife Federation for several years. Greg grew up in Orange Park and after attending the University of Florida came back to the area practice law. His interests include fishing, boating, scuba diving and fitness.